You don't have to wait until Halloween to dress up your favorite equine. These days it's easier than ever to make or buy costumes for horses. From unicorns to Santa Claus, tigers, zebras and hamburgers, no getup is too brash for your bucking bronco. Superhero: Forget about Superman. You can turn your Paint into Superhorse with a few simple supplies. A blue bodysuit can be embellished with a red satin cape emblazoned with a logo. Next, cover your horse's legs in red or blue polo wraps decorated with gold glitter glue to resemble cuffs. Wild animals: Go wild by using washable paint to add tiger or zebra stripes to your horse. Of course, the zebra costume is best suited for white or black horses. If you want to go all out, consider dying your horse's mane and tail black if they aren't already. Rainbow: Paint on large bands of color to make it look like your horse morphed into a rainbow. Top off the look by hanging a pot of gold around his neck. Unicorn: Add a horn to the middle of your horse's head to turn him into a majestic unicorn. This can be made at home using Styrofoam, paper mache or aluminum foil. You can kick this idea up a notch by strapping wings to your horse's back to make a Pegasus costume. Cow: Black and white Pinto owners will have a breeze pulling together a cow costume for their horse. All that is needed to recreate a Holstein is some homemade udders. This can be made from pink fabric attached to the saddle blanket so it hangs near the horse's underbelly. Dogs: Dog costumes are very versatile and can be modified to work with multiple types of horses. For example, an Appaloosa, which is known for its leopard-spotted coat would make an amazing Dalmatian. Simply make a large collar out of fabric and add some Velcro so it will stay fastened around your horse's neck. You could also make a tag from cardboard and write your four-legged friend's name on it. Then, punch a hole in the tag and attach it with yarn to the collar. Little Bo Peep and sheep: Cover a stretch sheet with balls of Fiberfill to mimic wool and attach it to the mid-section of your horse. Then, add ear coverings made from black fleece. 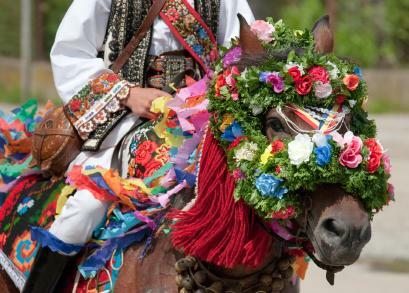 Next, place a flower wreath around your horse's neck. Finish off by donning a Little Bo Peep-inspired dress and carrying a shepherd's staff. Santa and reindeer: To add even more humor to this holiday-inspired pairing, have your horse dress up as Santa while you wear a brown sweat suit and headband embellished with antlers. Horse Santa will need a white beard, white hair and a red hat. In addition, you can use red cape or blanket decorated with jingle bells to round out the look. Betsy Ross and Flag: Dress up as legendary U.S. flag designer Betsy Ross and have your horse go as the stars and stripes. Cover the horse in a stretch body suit and drape a sheet that looks like a half-sewn American flag on his back. You can use Velcro to keep the sheet in place. Fire truck and firefighter: Embellish a red full-body horse suit with fire truck accessories, such as a logo and fake hoses. Then, place a red saddle on your equine friend and dress up in firefighter's gear and ride on the horse/fire truck. Keep in mind, if you go the custom costume route, you will likely spend a pretty penny dressing up your filly. A cheaper option is to embellish items you already have and shop for costume accessories in stores or online at WishPony.com. Either way, horse costumes are meant to be fun. If your equine reacts uncomfortably when you are trying to dress him, then you might have to reconsider your costume choice.